You must hold a valid U.K provisional driving licence and be legally entitled to drive. Your driving instructor reserves the right to withhold lessons if he suspects that you are not legally entitled to drive. You should always carry your licence when taking lessons. Robbie’s Driving School Instructors are self-employed franchisees of Robbie’s Driving School Ltd. All of them have been selected for their commitment to customer service. When you take lessons your contract/agreement is with your instructor personally and it’s his/her responsibility to provide you with all services you have paid them for. It is also your responsibility to pay your instructor for all lessons taken. (Either in advance or at the time of the lesson.) Advance payments are discounted with the block payment rates. Prices for lessons are laid out on this website and may be changed from time to time to allow for inflation and extra costs. Payment may be made direct to your instructor by cash or cheque or direct to the Robbie’s office by debit or credit card. (Credit cards incur a 2.5% handling fee.) 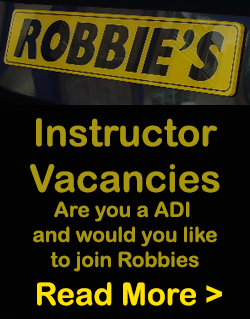 Robbie’s acts as an agent for card payments which go direct to your instructor. 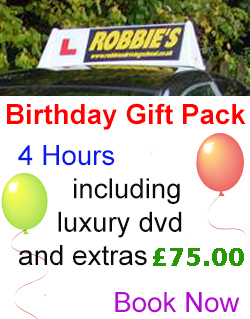 Whichever manner you make payment, your contract/agreement is always with your instructor, not Robbie’s Driving School Ltd.
New student offers are limited to one per new student and cannot be used in conjunction with any other offers. Whilst every effort is made to accommodate requested booking times, all pre paid lessons are subject to availability. You are behind the wheel of the car and must take responsibility for your actions. Controlling a car is a practical skill. Lessons are not an academic exercise and people vary in their levels of coordination and spatial awareness. This means you possibly might not achieve a level high enough to take your test. Your driving instructor is a fully qualified ADI and the lessons will be based on his/her personal opinion as to what is required for you. Safety is of paramount importance. It is solely your driving instructor’s decision as to whether you’re ready for your test. He/she will conduct a mock exam towards the end of the course to establish this. The financial transaction is between you and your instructor, who is a self employed franchisee. He/she undertakes, at the very least, to fulfil all lessons paid for. The driving test itself will comprise one hour of the lessons in the course. Time is very limited over a course and candidates must expect to operate under a degree of concentrated pace. A leisurely approach cannot be adopted! In the unlikely event that your instructor decides that you’re not ready to take the test the fee for this will be lost if it’s outside the four day cancellation period. Make sure you’re up for it! Plenty of sleep and abstinence help your performance. 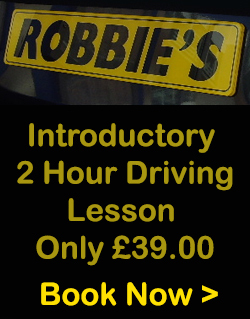 Initial lessons are normally booked with the office on one of Robbie’s Driving School contact numbers. After this all lessons are agreed on an ongoing basis direct with your instructor. Instructors are highly qualified people who’ve had to pass a number of exams to earn their licence to give tuition. Lesson content is based on what is best for your progress in their professional opinion. When booking lessons please remember that you are paying for their time. Should you need to cancel a lesson, your instructor must be informed direct. If less than 24 hours notice is given he/she reserves the right to charge for lost time. Driving tests should only be booked with the prior agreement of your instructor. You will only be taken for your test if your instructor believes that you have reached a suitable standard of driving before that date. This is your instructor’s sole decision. If you decide to cancel a test it must be made more than three working days ahead of the date or you will lose your booking fee.. The information contained in this website is for general information purposes only. The information is provided by Robbie’s Driving School Ltd and while we endeavour to keep the information up to date and correct, we make no representations or warranties of any kind, express or implied, about the completeness, accuracy, reliability, suitability or availability with respect to the website or the information, products, services, or related graphics contained on the website for any purpose. Any reliance you place on such information is therefore strictly at your own risk. Through this website you are able to link to other websites which are not under the control of Robbie’s Driving School Ltd. We have no control over the nature, content and availability of those sites. The inclusion of any links does not necessarily imply a recommendation or endorse the views expressed within them. Every effort is made to keep the website up and running smoothly. However, Robbie’s Driving School Ltd takes no responsibility for, and will not be liable for, the website being temporarily unavailable due to technical issues beyond our control.